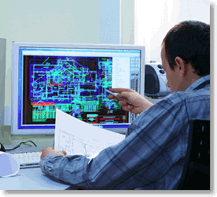 From simple drawings or map updates to large-scale projects, Northwind's staff can provide you with professional expertise in a variety of CAD software. Our technicians are trained in the following fields: architectural, mechanical, civil, roadway design and drafting, parcel mapping, and utility mapping. We provide cost effective services with strict attention to detail and high quality standards.